To collect pine tree resin, cut a small slash in the trunk. A gummy substance will begin to ooze out of the cut. Try not to get the resin on your fingers. I usually use a fallen leaf to "grab" the resin and then I tie it up with a piece of thread. If you don't want to wound a tree you can keep your eyes open for a pine that is naturally oozing. The resin can be used as an incense gum which when burnt clears a place of baneful energies. It can also be used as a 'counter-magic' incense to repel evil or spells cast against us by returning them to source. 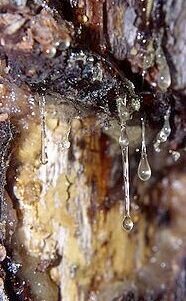 Pine resin has a wonderful aroma and burns slowly. You may also add crushed pine needles to the resin for a slow burning woodsy scent.